This is the step by step story of how I managed to get my Asparagus Bed ready and my Asparagus crowns planted despite the freezing ground and wet and damp dire Spring weather. Almost gave up, but the thought of being able to eat those juicy, tender Asparagus stems, dripping with melted butter, lemon zest and black pepper, spurred me on even though I nearly froze to death. Remember this photo of a huge bonfire waiting to happen? The biggest bonfire to burn! Well, we had a roaring fire going, and gradually moved the smouldering ashes slightly to the right of the lawn, where I had worked out my 4 foot by 16 foot space in which to make the Asparagus bed. What this did was to kill off the grass and some of the weeds, to enable me to find my trusty ‘girlie’ garden fork from the back of my shed, dust it down and start to dig. And dig …… and dig some more! 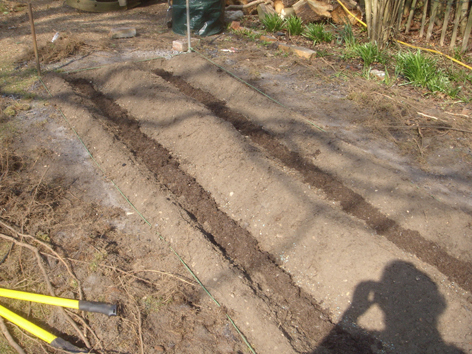 You know those moments when you think ‘Why did I ever start this?’ Early April in Hornsea was cold, the ground frozen (but the warm ashes had helped that patch of ground that was to be home for my Asparagus). Dressed in old trousers, thick woolly socks and my new, supposedly comfy, boots, Camisole covered in T-shirt covered in warm old jumper and topped with an old fleecy jacket zipped up to cover my mouth, finished off with a scarf and gardening gloves, I hoped and prayed no-one would come a-knocking on my door. I wasn’t a pretty sight! The Asparagus I chose to buy at first was from Sarah Raven, but when I realised that the crowns would be sent to me in March, I realised that my bed wouldn’t be ready, because of the snow. I had another ‘recce’ through my catalogues and on the internet, and I found the Asparagus Collection pictured above, from Thompson & Morgan – this set of crowns was going to be sent out to me in April – hopefully in better weather, or so I thought! It consisted of ‘Ariane’, ‘Mondeo’, ‘Pacific 2000’ and ‘Purple Pacific’. But hey-ho, there was a job to be done. Time was my enemy. First of all, I dug down and loosened the soil. Then came the big task of kneeling down and, using a hand fork, I started at one end of the site and worked every piece of soil, digging out any small roots (a lot from the hedge some 6 foot away), weeds, big stones and roots from dead trees and bushes – anything that could be a hindrance to my precious Asparagus roots. This job took me 2 days, from 9.30am in the morning until 5.00ish at night. Wrapping the thin ‘whippy’ roots around my hand and pulling them out individually hour after hour left me with very sore hands (or is that just old age?) And it was a good job that the inclement weather kept my new neighbours out of their gardens, because some of my very unladylike language would have blackened me in their eyes! That horrible job took 2 days. The final tortuous hour on that incredibly damp day ended up with me, so tired that I was laid on my side on the ground, resting one elbow on the soil and digging out the last patch of debris with my fork and very ‘achy’ hand. I could barely stand up at the end, but the feeling of ‘Thank heavens – I’ve actually done it’ washed over me, as I staggered into our house, the warmth flooding over me and thawing me out. This Asparagus is what it’s all about. Next step – I had to prepare this now weed and root-free bed by digging in lots of our brilliant compost along with top soil mixed with some of the ash from the bonfire (which helps retain moisture in our sandy soil). And all this had to be ready for when the Asparagus Parcel turned up on our doorstep. So dig I did, and forked in my cocktail mixture of goodies to welcome the Asparagus crowns to their new home. The next step was to water it all thoroughly. Then panic! The Asparagus Crowns were delivered to our door from Thompson & Morgan. I opened the parcel, and the Asparagus crowns were already sending out tiny but very healthy looking white shoots. Help! Back to the site, where I spent that morning creating two flat trenches, 2 ft (60cm) apart, each about 8 inches (20cm) wide, using the soil to make a mound in the middle separating the trenches. I added a gentle sprinkling of Grow More Granules, and of good old Saxa table salt (Asparagus is similar to Samphire, and likes salt). Once again the soil was watered, which made it rather muddy, and guess who got covered in it all? How come Sarah Raven or Carol Klein never look like they’ve had a mud bath when gardening? Is it just me? But back to work. In the middle of the flat trenches, I used the loose soil to make a small mound from one end to the other, about 3/4 inches (10cms) high, and laid the Asparagus Crowns of the top of this little mound with the roots dangling down the side, spaced approximately 15 inches (30 cm) apart. Then, again using the loose soil from the middle, I sprinkled about 3/4 inches (10 cms) soil to cover the crowns and roots completely – aware that the nights were still frosty. Asparagus crowns and roots tucked up under a blanket of soil. Yes, that’s me with the camera, photographing my work of art, or so it felt. Next step, day by day, was to sprinkle a bit more soil on, and gradually, over a period of about 2 years, those trenches and mounds will become level. Watering every day to begin with is important, and hey-presto, after a few days little Asparagus shoots peeped through the soil. Was I thrilled? You bet! Erik, meanwhile, thought he would do do a bit of research to reward me for all my hard work. Even though I used to own a cookshop, and manage a huge cookshop in York, the one item of cookware I didn’t own was an Asparagus Steamer. So he trawled through the internet and found a brilliant one for me to use – substantial, and also useful for blanching other vegetables before freezing. Multi-use, that’s what I like. 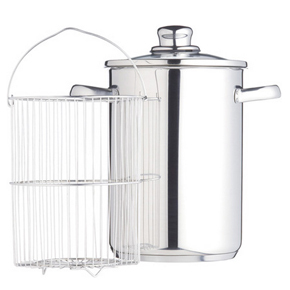 Have a look at the Asparagus Steamer from Divertimenti. 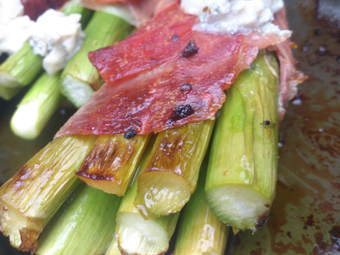 Asparagus Steamer – just what I needed! But the next job was down to Erik. He set to, and made the raised bed frame around the already planted Asparagus. The whole reason for this is to protect our Asparagus from our two large Airedale dogs and the many Squirrels, Pigeons and Foxes that roam our garden, so this will not actually be a raised bed, but will be a bed protected from all furry or feathered creatures that want to eat, bury a conker or just roll in the nice soil. So, this is Erik’s brilliant protection bed for our Asparagus. It will have 4 top sections that I can lift off easily, but these are strong enough not to blow off if the weather is windy. 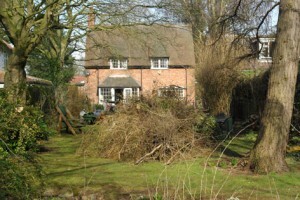 We will paint it a gentle green to camouflage it, and in the picture above, you will see that I have planted 4 roses to create a 3/4 ft hedge of roses, so that it is hidden from the house. 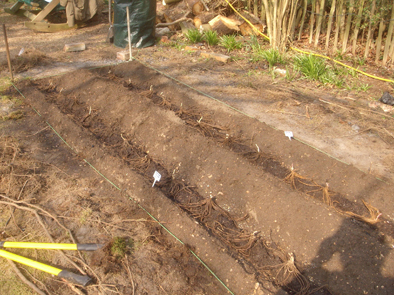 The wooden bed does look big, but will give us (hopefully) almost 2 months of Asparagus. 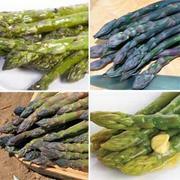 It is vital to weed regularly, as Asparagus does not like competition for it’s soil or vitamins and minerals. Also, once it gets established, especially towards it’s growing season (May/June), make sure it never dries out. Asparagus stems reaching for the stars after only a few weeks! And this is the (almost) finished result. If you look very closely, you can just see the very thin spears of Asparagus, which have shot up to almost 3 feet. We leave those to turn to fern, which will put the goodness back into the crowns for next year. In Autumn, when the fern turns orange then brown, I will cut it down, give the whole bed a sprinkling of salt, and mulch it well with more of my compost/top soil mix, and top it with a bark mulch to keep it warm over winter. Then, next May, when more Asparagus appears, we can actually eat some of each plant, but leave some to feed the crowns for it’s third year, 2015. And then we can eat almost all of it. And all this hard, muddy, painful work will be forgotten.